Traditional Painter, Mark Roberts has been hard at work. Here is a selection of recent Painted kitchen and bedroom furniture in the NW in Cheshire and on the Wirral. 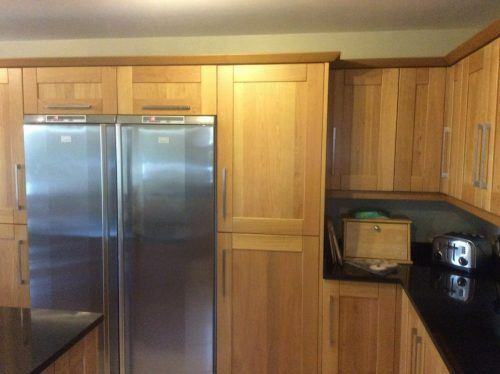 This kitchen is a familiar sight in many UK homes: well fitted, stylish, natural wood finish. In this case, the homeowner wanted a more contemporary look. 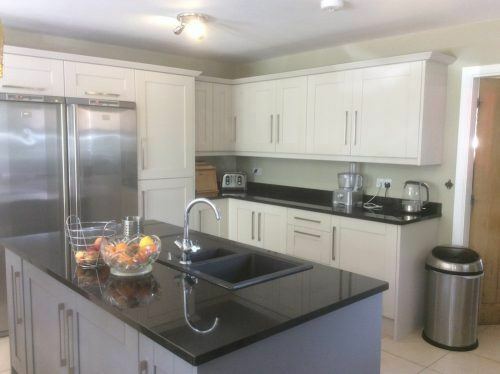 The question is, do you replace the whole kitchen, or have the current kitchen painted by a reliable specialist? 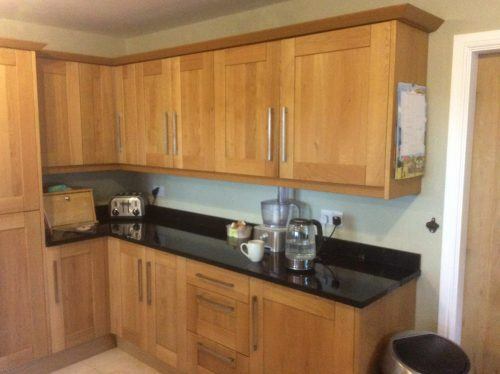 This is a link to a popular summary of the choices and options for refurbishing a kitchen. In this instance, the clients decided on painting. They did their research and thought Mark was the right choice, with his mix of extensive experience and friendly professional approach. His service didn’t disappoint. With good colour selection and meticulous attention to detail, the whole aspect of the kitchen has been transformed. This is a kitchen Mark painted at a 5 star AA-rated luxury B&B – Mitchell’s of Chester. If you check out the reviews, their kitchen is more than the heart of the home, it is the engine behind their business. 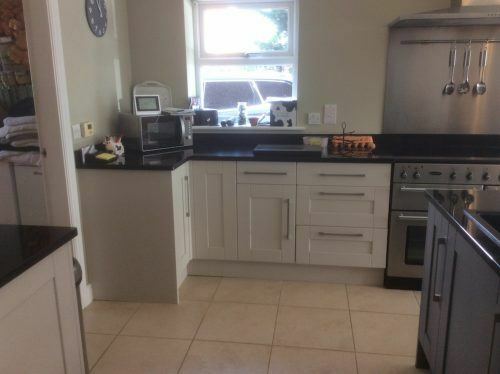 They closed for 2 weeks for the kitchen work to be completed as efficiently as possible. It was quite the transformation, including new tiles and decorating in addition to the painted kitchen cabinets. The paint used was Tikurilla Otex primer and Helmi 30, mixed to Farrow and Ball Archive. If you note the parrot cage in the corner of the picture! Jimmy – the parrot, was talking to me from behind the door and nearly sent me demented with his realistic telephone noises and impersonation of both his owners voices ? We spend (or should spend!) as much time at rest as we do at work or play. Apparently missing an hour of sleep a day is sending us all slowly mad. Back on to a topic that I am qualified to answer questions on! When it comes to redecorating a bedroom, invariably the existing furniture comes under scrutiny. Replacing a large bedroom suite is often not an option. Wall colours and accessories therefore have to fit around the colour and look of (dated) bedside cabinets, bedheads, dressers and so forth. That is fine, but can be quite challenging, or limiting. Some will simply take a financial deep breath and replace all the cabinets and wardrobes with brand new painted bedroom furniture. You know the new furniture will fit in with the new colour scheme designed from scratch. Mark’s painted furniture services are really good value when customers who are considering buying new, start to look around the shops! It isn’t 1989 any more. Often, older furniture is much better built than some of the new ranges on sale. And what a price it can be for well made cabinets from the big stores! So if you want to dodge the expense of swapping out a suite of bedroom furniture (or dining furniture) for new, painting becomes a very affordable alternative. 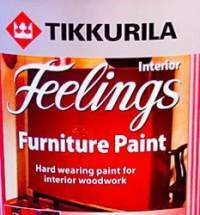 Just need to find the right person to trust to paint your furniture! – While work was in progress you can see the carpet was thoroughly protected. Furniture was raised on blocks. The green bars are part of an erecta rack to keep loose pieces safe and stacked while work is in progress. – There is almost no limit on colour choice. 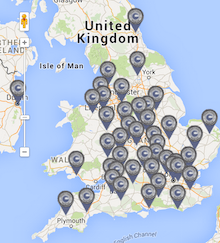 Mark can get the best furniture paint matched to the client’s preferred colour choice. – The once plain wood has gained a new lease of life painted in a neutral light colour. As always, if you want to see what paying customers have to say about the level of workmanship and service on offer, check out Mark’s reviews. His own website is here if you want another way to contact him.